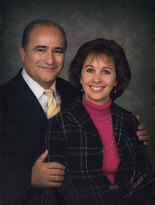 Luis Ramos graduated Hyles-Anderson College in 1985 with a degree in Pastoral Theology. He worked as assistant pastor for Dr. Keith Gomez at Northwest Bible Baptist Church, in Elgin, Illinois for nearly four years. And, in 1989, Bro. Ramos started Bible Baptist Church in San Luis Potosí, Mexico. More than fourty churches have been established across Mexico out of Bro. Ramos' ministry. In 1992, he started Maranatha Bible Institute. Eighty-five students have graduated, to date. In addition to his Bible college, the church runs a Christian school, orphanage and Bible-printing ministry. They have distributed more than two million copies of John and Romans throughout Mexico and printed over 2.5 milliontracts. Their church's average attendance is more than 1,500, and in fourteen years of ministering in San Luis Potosí, over 35,000 people have been saved. One Pioneer from this work, Juan Robles, is now serving in Panama. See the fruit of this work in the slideshow below.